Cambridge BMX volunteers had the local track in excellent condition for Superclass racing on Tuesday night, where 82 riders including 34 elite men and women competed over PRO race jumps. Photo – Michael Jeans. Cambridge has been a hive of cycling activity over the past fortnight, starting with the UCI Track Cycling World Cup over last weekend weekend, and the New Zealand Cycle Classic and Cycling Festival held Tuesday to Sunday last week. 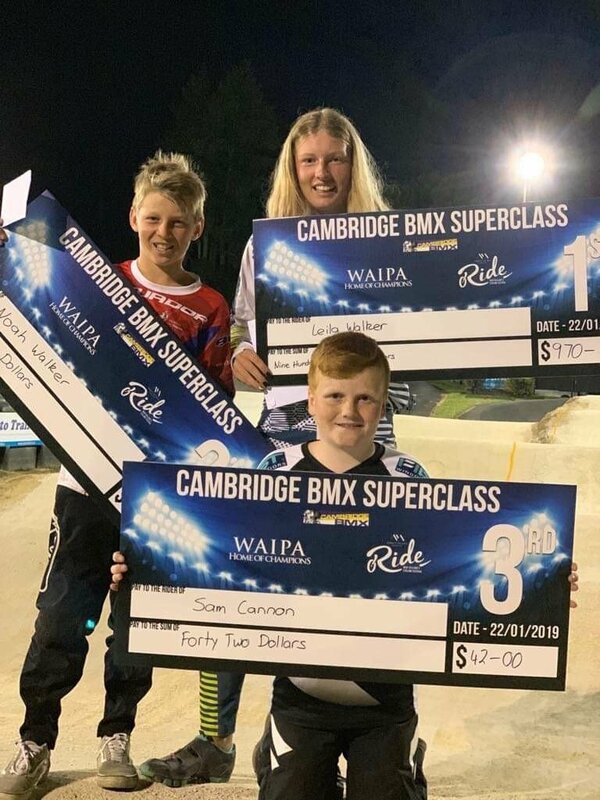 As part of the festivities, the Cambridge BMX Club hosted a Superclass event in conjunction with the RIDE New Zealand Cycling Festival. 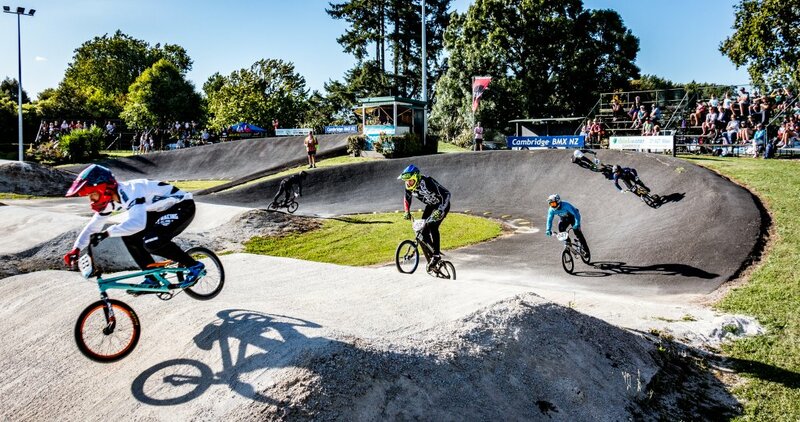 Several riders from the weekend’s Oceania BMX Champs stayed on to take part in the special event on Tuesday night, drawn by a tantalizing prize purse of $4000. Local riders Noah Walker, Leila Walker and Sam Cannon with their big Superclass cheques. Riders from Belgium, the Netherlands and Germany also raced the Leamington track, competing against some of the country’s best up-and-coming riders, including our very own six-time world champion Leila Walker. Only just old enough to take part, Leila swiftly passed her older competitors to win the 14 plus women’s division over Te Awamutu’s elite national rider Rebecca Petch. The men’s division, set at 15 years old and over, saw another Cambridge local, Tasman Wakelin, make the podium in second place. Younger age group riders also competed for cash on the night. A beautiful summer’s evening made the event all the more special, with a DJ and food trucks making for a “great atmosphere” as described by one Cambridge BMX Club parent, Sharon Greenough. “A lot of work from the club volunteers had the track in excellent condition, with the big PRO Jumps running and a great atmosphere,” she said. It wasn’t just BMX families in attendance, but members of the public too, enjoying the speed and skill of BMX riders as they raced bar to bar over big jumps.